Secondary Steelwork – including windposts, trimming, brickwork supports etc. 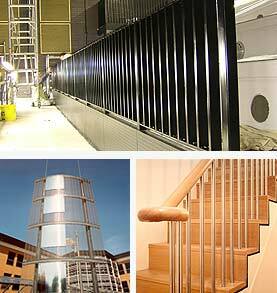 Feature Staircases – including timber treads, glass balustrades, stainless steel and aluminium, high quality finishes. On-site welding and fabrication – available on a dayworks basis to include all aspects of welding, burning, cutting and erection. We employ comprehensive Quality Management Systems to ensure your project is exactly as required.